This article was written By John Berra on 22 Dec 2010, and is filed under Reviews. In the intellectually weighty 1998 tome Death and Metaphysics – Heidegger on Nothingness and the Meaning of Being, Death and Philosophy, Peter Kraus argues that, ‘It is in anxiety and the encounter with death that we realize the reality of nothingness, or, better, the nothingness of reality, as well as our own existential nullity.’ This is a philosophical view that seems to be shared by the Thai filmmaker Pen-Ek Ratanaruang whose international breakthrough Last Life in the Universe is an intoxicating exploration of anxiety and existential crisis. At first glance, Last Life in the Universe is one the calmest cinematic experiences of the past decade but, as with the seemingly placid protagonist as its centre, the cool surface of Ratanaruang’s fourth feature gradually points to a deeply-rooted desire to disconnect from the world due to indifference to existence. Comparisons have been made between Ratanaruang and Wong Kar-wai, mostly due to their close collaborations with cinematographer Christopher Doyle, but the similarities between the two filmmakers are superficial at best. Wong has made a series of films that have been inspired by urban environments or moments in time, such as the tenement buildings that feature prominently in Chungking Express (1994) and Fallen Angels (1995), or the periods of Hong Kong history that are vividly recreated in In the Mood for Love (2000) and 2046 (2004). By contrast, Last Life in the Universe is concerned with the psychological vacuum of a protagonist who is in a state of social withdrawal, rather than the shifting landscape of an Asian metropolis. Last Life in the Universe marks the emergence of Ratanaruang’s intuitive approach to the filmmaking process after initially operating in the commercial industry, then making colourful but inconsequential features for the Thai audience. Ratanaruang made his directorial debut with the crime caper Fun Bar Karaoke (1997) and followed it up with the similarly slight 6ixtynin9 (1999), with both films being lightweight, locally-financed affairs that found success in the domestic market. Healthy box office returns enabled Ratanaruang to embark on the more logistically ambitious Monrak Transistor (2001), which followed fellow Thai filmmaker Wisit Sasanatieng’s Tears of a Black Tiger (2000) in its appropriation of both Hollywood and Bollywood musicals to a tale of Thai folklore. Fun Bar Karaoke, 6ixtynin9 and Monrak Transistor are quintessentially Thai in terms of audience appeal, cultural reference points and production background, but Last Life in the Universe would be a more international affair, both industrially and thematically, with worldwide sales agent Fortissimo Films providing funding and Ratanaruang examining the universal condition of urban loneliness. In an interview for Artificial Eye’s UK DVD edition of Last Life in the Universe, Ratanaruang talks about ‘finding’ the film during the editing process and explains his non-committal attitude towards narrative; this is particularly evident in Last Life in the Universe wherein the title of the film does not appear until the thirty-third minute, indicating that the director has intuitively explored certain elements before unifying them as a cinematic whole, thereby jettisoning any prior concerns about local audience acceptance. 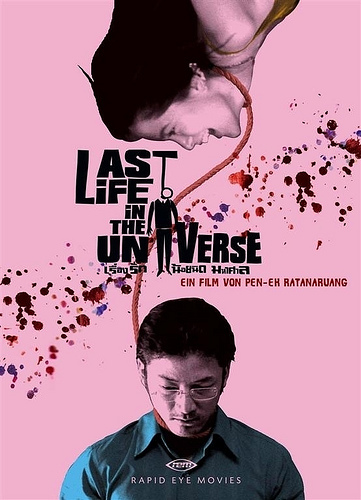 The narrative of Last Life in the Universe is subservient to the existential angst of Kenji (Tadanobu Asano), a mild-mannered Japanese library assistant who has relocated from Tokyo to Bangkok, finding work at the Japan Foundation but making no attempt to establish a social life. Instead, he is preoccupied with death and comes close to committing suicide on a number of occasions; attempted methods include hanging, smothering and shooting himself, not to mention lying under a stationary vehicle and waiting for it to move. His solitary existence is rudely interrupted to the arrival of his brother Yukio, an untrustworthy member of the yakuza who has fled Tokyo after falling out of favour with his boss. Leaving his brother to his drunken devices, Kenji is psyching himself up for another suicide attempt at a freeway bridge when he witnesses a horrific accident; Nid (Laila Boonyasak), a teenage girl, who he had observed in the library earlier that day, steps out of a car following an argument with her older sister Noi (Sinitta Boonyasak), only to be suddenly struck down by another vehicle. Kenji begins a tentative friendship with Noi, who seems to be his polar opposite; Kenji is obsessed with cleanliness and neatness, while Noi is untidy and thinks nothing of letting the washing pile up in the sink and leaving dirty clothes scattered across the floor of her home. When Kenji’s brother is murdered by an underworld associate, he shoots and kills the hitman with a gun that Yukio was carrying, leaving the bodies in his apartment and deciding to stay with Noi. The two ‘opposites’ find that they actually have much in common but Noi’s departure to Japan to undertake a hospitality position and the arrival of more gangsters from Tokyo bring about an abrupt end to their burgeoning relationship. Although eventful and unpredictable, Last Life in the Universe is not an example of narrative urgency; the sedate pacing mirrors the psychological state of the central protagonist and it is only when additional characters or unforeseen events come into play that Kenji is forced to perform acts of consequence. The film can be seen to subscribe to Jean-Luc Godard’s maxim that, ‘all you need to make a film is a girl and a gun’, in that plot points are pivoted on the entrance of a pro-active female character and the occasional eruption of graphic violence. In terms of genre, Last Life in the Universe features underworld characters and a couple of corpses, but it is certainly not a crime film. Ratanaruang instead emphasises the relationship between Kenji and Noi and, in terms of popular story-telling, this makes the film a culture-clash comedy, with two individuals with opposing lifestyles assisting and improving one another when forced together due to unusual circumstances. By spending time together, taking day trips to the beach and exchanging linguistics tips over bowls of noodles, Kenji and Noi gradually discover common ground and form a bond that remains largely unspoken and unconsummated. In his exchanges with Noi and others, Kenji’s uses of language ranges from Thai to Japanese to English, with Ratanaruang using the fact that his central character is culturally dislocated to make a statement about the universality of his depressed condition. Through his suicide attempts, Kenji comes close to death but never really shows signs that he really wants to end his mortal existence. 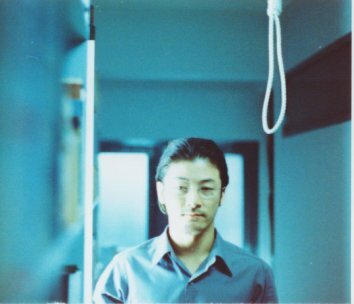 Kenji is curious about death and clearly wants to experience some of the calm which may come from no longer existing in the physical sense, but his inept approach to hanging or smothering himself reveals that he crucially lacks the courage of his convictions. The darkly humorous approach that Ratanaruang takes towards Kenji’s near-death experiences – elaborate suicide set-ups that often result in cruelly amusing pratfalls – suggests that they are statements of loneliness rather than fully-fledged suicide attempts. Kenji’s loneliness is represented in the form of the lizard that lives in Noi’s house, and the image of a lizard that adorns the children’s book that he borrows from the library; like the lizard, Kenji feels alienated from society, and believes that nobody shares or understands his thoughts. The opening image of Last Life in the Universe is of a lizard crawling on a wall; the colour of the lizard is similar to that of the wall, and it almost blends into the background. This is an effect which Kenji aims to achieve in his daily life, dressing in the plainest possible formal clothing and consciously avoiding the friendly advances of his co-workers, one of whom even seems to be romantically inclined towards him. Evidence of Ratanaruang’s existential approach can also be found in his exploration of environment. Reviewing the film for Reverse Shot in 2005, Tom J. Carlisle summarised Last Life in the Universe as, ‘a slow-moving study in austere rhythms and space’, while noting that, ‘the camera makes a meditative, unhurried examination of the objects in rooms and of the rooms themselves.’ This is an appropriate assessment of how Ratanaruang frames the homes of Kenji and Noi; the director dwells on objects and the manner in which they have been arranged in order to reveal character through respective attitude towards personal space with Kenji’s apartment being as obsessively organised as Noi’s house is messily neglected. Some shots are almost examples of still life, with Ratanaruang capturing rooms that have a sense of self-contained calm yet also speak volumes about the inner turmoil of their inhabitants. Christopher Doyle’s carefully muted cinematography lends Last Life in the Universe a ‘day-for-night’ scheme whereby time becomes non-specific and one day blurs into the next. Before the entrance of Noi, this enables Ratanaruang to observe how Kenji’s anxieties have manifested themselves in even the smallest of details of his daily life, ensuring that his sense of self is gradually slipping away amid an adverse reaction to surrounding society. The central character in Last Life in the Universe does not easily escape from these anxieties. After dropping Noi off at the airport, Kenji returns to his apartment, only for other members of the yakuza to arrive while he is in the bathroom. In a conscious attempt at self-preservation, Kenji evades these tough guys by making his exit through the bathroom window. However, his flight to freedom proves to be short-lived as Kenji is last seen in police custody after being apprehended in connection with the shootings in his apartment. Kenji’s crime was committed in self-defence, but at this point Ratanaruang also reveals the tattoos on his body, indicating that he was involved in yakuza activities before relocating to Bangkok and that the local justice system may not be lenient on him. Kraus states that, ‘The world of beings, the world on which we base our daily life, on which we rely, and by means of which we ordinarily define ourselves, slips away and our attitude becomes one of indifference to the world of being.’ Ratanaruang teases the audience with glimpses of a reunion between Kenji and Noi, but regardless of whether this is real or imagined, it suggests that Kenji has overcome such indifference and taken significant steps towards choosing human connection over self-imposed isolation.